Being in debt can be an isolating experience, and one which can be hard for people to talk about. If your friend was going through a divorce you would support them in a heartbeat, but when it comes to debt this can be more difficult as it can still be seen as a taboo subject – and if you personally haven’t experienced debt, it can be difficult to understand what they are going through. We have highlighted some of the signs to look out for if you think a friend or family member is experiencing problems with money. They don’t want to socialise – Suddenly becoming withdrawn and avoiding social events, could be a sign of money worries as they may be trying to avoid spending money or talking about their problems. Previous debt – Debt may be something they find difficult to escape. There is the possibility they have learnt how manage their money however, they may also have spending habits which were never resolved and could have fallen back into debt. They’ve suffered a loss of income – Life events such as a serious illness, splitting from a partner or being made redundant can lead to financial hardship. Their spending habits have changed – Drastically reducing or increasing their spending, could also be a sign of money problems. Also if they are heavily relying on their credit cards. Their weight changes – Putting on or loosing weight drastically can be a sign of stress which may be a result of them worrying about money. If any of your friends are showing these symptoms, you should let them know you are here to talk. Some people still won’t feel comfortable doing so, but letting them know you are here for them for when they are ready can lift a weight off their shoulders. Whether they do decide to open up to you or not, we have listed 5 ways below that you can take to support a friend in debt. Usually friendships involve going out for dinner, to the cinema or even for a cup of coffee. When someone is in debt these activities can cause a real financial strain but they may not want to seem like a bad friend and may feel obligated to ‘act normal’ which can lead them falling into either more debt. Try to avoid asking them to do things which cost money. Instead suggest things you can do for free instead. Try to plan activities together which don’t cost a penny. This could involve having a catch up at home over a cup of coffee, going for a picnic in the park with food you have made up at home or even just going for a walk. Making the effort to just go over to their house for a chat and not pressuring them to do things that cost money, will be greatly appreciated and could lead them opening up about their money problems. If you’ve just come back from the holiday of a lifetime, try not to flaunt this in your friends face. Of course it’s natural to be excited and want to tell but it’s important to be mindful that this could make them feel even worse about their own situation. If you have just bought a new TV or booked that dream holiday, try to be sensitive to your friend as they may be struggling to put food on the table. One of the worst things you can do for your friend is lend them money. By bailing them out you not only risk putting yourself in financial hardship, but also lead them to become reliant on others and not receive the help they need. There’s also a good chance your friend won’t pay you back, even if you don’t expect the money back, they may feel a sense of guilt which can lead to a strain in your relationship. The best thing to do is be there for them and offer emotional support rather than financial. It can be difficult to know who to turn to when suffering with debt, so one of the best things you can do for a friend is to help them find the right support and let them know they are not alone. There are various organisations that offer free debt advice and support such as, Citizens Advice and StepChange. Another good resource is the Debt-Free Wannabe section on Money Saving Expert forums where people can share their debt stories to help others. People fall into debt for all kinds of reasons and everyone who is struggling with debt needs a good friend. 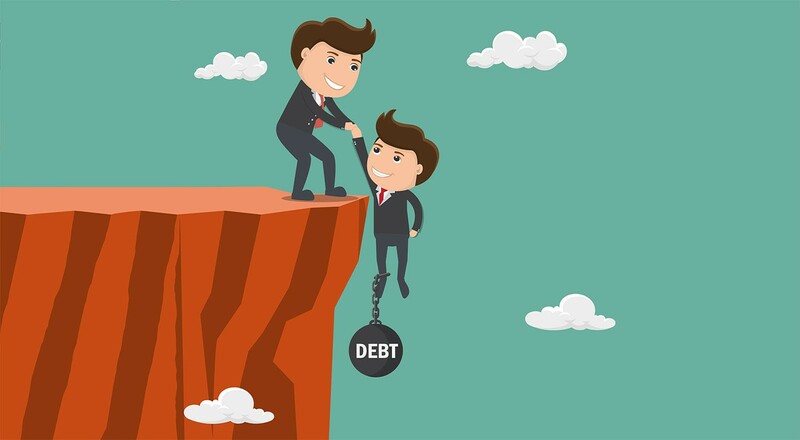 If you or a friend needs debt advice contact us today on 0808 156 7730, or to read more about your options for dealing with debt, click here.